Timing is everything, especially when it comes to gardening. 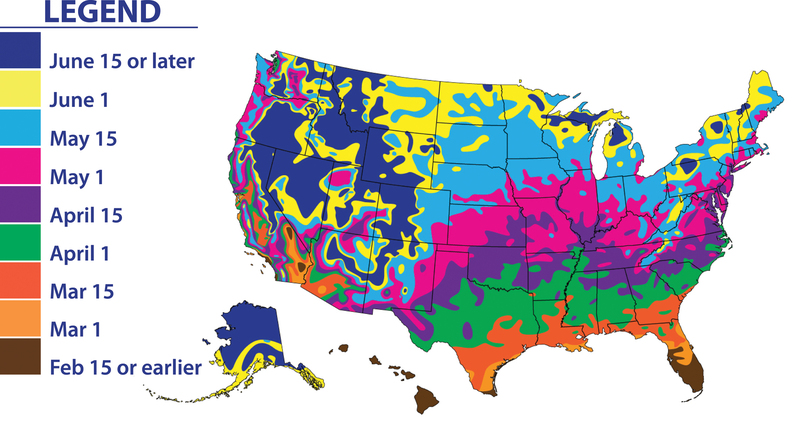 If you plan your spring plantings around the average last frost date of your region, you’re sure to have an ideal garden season. To optimize your harvest rewards, find your date on the map and then follow our weekly timing suggestions. 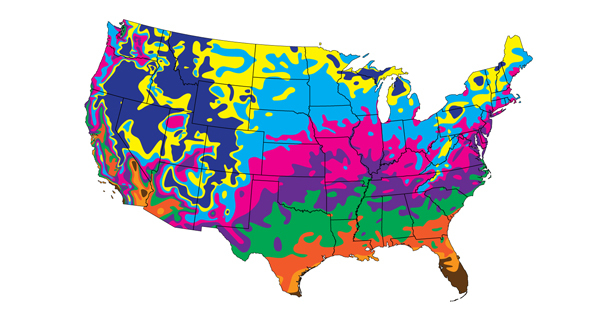 Average last spring frost dates are in the Map Legend below. 17 weeks before your average last frost date: you should think about doing the following; order your asparagus crowns, sow your parsley seeds, thyme seeds, and onion seeds. 16 weeks before your average last frost date: you should think starting your oregano, chive, basil and leek seeds indoors. It is also a good time to turn your compost pile. 14-10 weeks before your last average frost date: you should think about starting these seeds indoors; dill, cilantro, celery, celeriac, collards, kale, lettuce, cauliflower, broccoli, kohlrabi, and cabbage. Its also a good time to get your cold frame read to go. 9 weeks before your last average frost date: you should think about starting these seeds indoors; eggplant, peppers, savory, fennel, anise and chervil. 8 weeks before your average last frost date: you should remove some of the mulch on your strawberry plants (if they are showing signs of new growth), check your earlier indoor starts for first set of true leaves; transplant into larger pots when that happens, and fertilizer any asparagus that is already planted in your garden. 7 weeks before your average last frost date: you should move your leek, onion, and lettuce starts from indoors out into your cold frame to harden them off before planting into your garden. It is also a good time to sow your carrot, beet, leaf lettuce, pea and spinach seeds directly into your garden soil. If you grew a cover crop, this is a good week to turn them under. 6 weeks before your average last frost date: you can put your onion starts into the garden. It is also time to divide your rhubarb crowns and replant. Seeds that can be direct sown outside are lettuce, swiss chard, kale, radish, beet, kohlrabi, and parsnip. 5 weeks before your average last frost date: you should start your tomato and basil seed indoors. It is also time to transplant the leek plants you started indoors out into the garden. If you already have your potatoes, now is the earliest you should plant them. Weeding the garden should also be a priority this week as you get ready all the action! 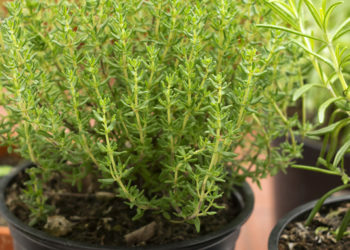 4 weeks before your average last frost date: you should get the rest of your herbs started indoors. Mustard seed can now be direct sown into the garden. You should also start hardening off your cabbage, broccoli, cauliflower, and Brussels sprouts plants. Hardening requires your plants to be moved outside into a spot that is sheltered from direct sun and wind for 2 hours per day, do this 4-7 days before transplanting. 3 weeks before your average last frost date: you should start the following vegetable seeds indoors, squash, melon, cucumber, gourd, cilantro and dill. Out in the garden you can thin your beets, carrots, parsnip and onion plants. If you have not already done so, direct sow your pea, cauliflower, onion, lettuce, spinach, chard, kale, and root crops into your garden soil. You can also use this week to start another sowing indoors of cabbage and broccoli which will give you another planting later in the season. 2 weeks before your average last frost date: you should sow your leafy greens directly into the garden. Flea beetles could become a problem on the cole crops already in the garden, use Food Grade Diatomaceous Earth to control them. Watch for your asparagus spears to start pushing through; only harvest the spears that are as big as your little finger. Leave small spears untouched. If you have potatoes growing, take a few minutes and hill them. This is also a good time to transplant strawberries. 1 week before your average last frost date: you can sow your first bean seeds. It is also a good time to harden off your tomato seedlings. The chard, spinach and other leafy greens would appreciate a thinning during this week. The week of your average last frost date: you can sow sweet corn, cucumber squash and melon seeds directly into the garden. If you have transplants for these vegetables, you can go ahead and set them out now. 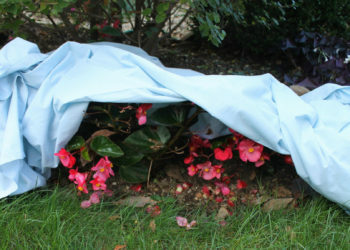 Pay close attention to the weather forecast, if it is going to frost or drop below freezing, cover the plants for the night. This is also a good week to sow an additional seeding of leaf lettuce, carrots, beets and radish. 1 week after your last frost date: you can direct sow Okra seeds into the garden and sow your second crop of bean seeds. It is also time to set out all your transplants. 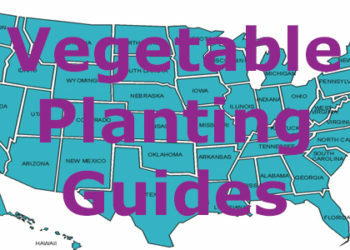 After this week, you should have all vegetables sown or transplanted for your spring garden.